The museum is located in a traditional building within the city of Ibb. Though small, it houses one of the most beautiful and significant collections of bronze artefacts from ancient South Arabia. Most of them were discovered in the pre-Islamic site of Jebel al-ʿAwd, south of Ẓafār. Three groups can be distinguished among the collection of bronze artefacts. The first comprises South Arabian – Ḥimyarite and Qatabanian – objects; bronze vessels, bronze statues such as bull’s heads, inscriptions. The second group has a large number of imports from the Graeco-Roman world, particularly statuettes of women and goddesses. Finally, some finds are clear imitations of the Graeco-Roman imports. Two texts are dedications to a local goddess called Rgbm: the first is engraved on a bronze plaque; the second is incised with the double trait technique all around the body of a recumbent sphinx. A bust representing Athena, probably an imported object bears on her neck a South Arabian inscription. 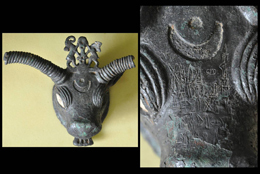 There are also two representations of a bull’s head with an inscription on the animal’s nose: one consists of a small pendant, while the other is a bigger sculpture, enriched with two ibexes in front of a life tree, between the bull’s horns. The inscribed pieces of the Ibb museum were catalogued within the CASIS project in July 2009. Photos are courtesy of the Ibb Museum.